I’ve always enjoyed albums that play with the concept of recording in some way– an artist sampling from other tracks on the same album, collections of found sound, or even musicians breaking the third wall to address the listener directly. 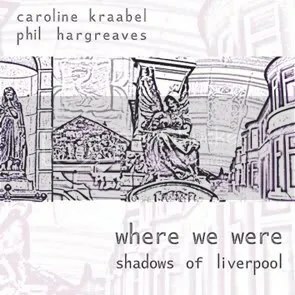 When the Leo Records release of Caroline Kraabel and Phil Hargreaves’ “Where We Were (Shadows of Liverpool)” begins with an anonymous listener telling a crowd, “we’re going to start off by listening to some fantastic music,” it’s one of those they-know-that-you-know situations. It’s this type of nested-doll thinking that permeates “Where We Were,” Hargreaves’ and Kraabel’s musical exploration of Liverpool. You see, unlike a ‘pure’ field recording, Hargreaves and Kraabel abandoned the idea of documenting a location in favor of playing it– and then went one step further, from the place-as-instrument concept to something more like recording-as-place. Don’t worry, I’m having a bit of a difficult time explaining it to myself, despite my great enthusiasm for the results. Kraabel and Hargreaves give their all to this recording; using the alto and tenor saxes to flesh out a greenhouse, a tunnel, an anechoic chamber, and four other unique environments. Throughout, the crystal-clear binaural recording reveals the dual purpose of many of the players’ musical choices– a combination of improv feel and physical need– one gets as much a sense of heart as of the shape of the local geography!Consider a point about at about 17:30″, where the long tails of sax notes suddenly disappear, with the ‘virtual room’ crushing down around the listener, a claustrophobic experience of sonics. Somewhere near 29:00″, a series of truncated honks punctuates total silence before flowing into a larger, more open space where similar honks are free to linger about the listener’s head. In a sneaky way, Kraabel and Hargreaves lay the old “studio versus live performance” question to rest, showing listeners that neither can be fully realized without the other. The performance aspects of the album give listeners an “on the ground” quality often unheard from studio-tanned musicians, while the engineering allows the effective and telling ability to contrast and hybridize these original recordings. As disingenious as it is for me to admit, “Where We Were” is one of those albums you’re just going to have to hear for yourself before gaining any real understanding of what’s happening. I recommend that you do, though, it’s definitely worth the effort. As a delightful bonus, Hargreaves and Kraabel maintain a website specifically for the album, packed with extra information about all aspects of the recording. I find the section detailing each location to be of special interest. This entry was posted on August 20, 2007 at 12:11 pm and is filed under avant-garde, experimental, experimental music, improvisation, music review. You can follow any responses to this entry through the RSS 2.0 feed. You can leave a response, or trackback from your own site. thanks for the review and link. being a field recorder i like the idea that musicians playing acoustic instruments went out to the “fields”. Matthew Herbert is another composer who likes to record on special locations.